Patrick Salaski, Faculty Member, BAInstitute.org and Principal Architect and Owner, Vision 2 Reality, Inc. Most new business architecture (BA) teams jump right into defining business architecture models and frameworks. They spend incredibly little time defining the practice itself, what they want it to be, and how they are going to drive results. Yet this is where the challenge is. Join Gregg Rock and two senior BA instructors, Linda Finley and Pat Salaski, as they discuss the objectives and unique value proposition of each of the core BA courses you need to get your practice off the ground and ensure long-term success. 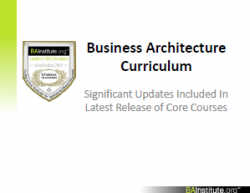 The BA curriculum is designed specifically for individuals and organizations seeking to establish a standard BA training roadmap for their BA practice.